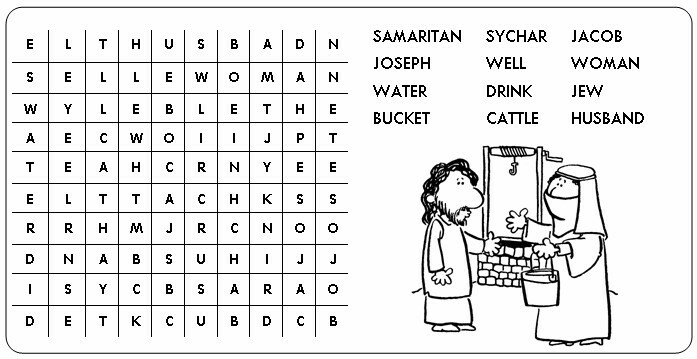 The Gospel of the third Sunday is the remarkable conversation between Jesus and the Samaritan woman by the well, the theme is water - which gives life, which cleanses, which is so necessary. This reading forms part of the catechesis given before Baptism at Easter: the candidates who would go into the water are invited to reflect on what that means. But more necessary than the water which gives life is the water which gives eternal life - the water of baptism, the water flowing from Jesus’ side on the cross. Even if your Church does not have any candidates preparing for Baptism, we will all renew our baptismal promises at Easter: we should take this opportunity to reflect on what baptism has given us, and what God has done for us in this gift. Again you are telling a story – perhaps the simplest form of scripture reading in Church. You still have to be clear and confident, and do your best to engage the interest of the congregation. The first word of the reading should convey the desperation of the people: ‘Tormented by thirst...’ There is a wonderful drama in the words of the people, of Moses and of the Lord: make the fullest use of it - not by ‘overacting’, but by allowing the meaning to come through your tone, pitch and speed of voice as well as through the words. Realise that the key word is ‘water’; emphasise it on the occasion it appears. This reading is important because it gives the congregation a context in which to hear the Gospel that follows. Second Reading: Romans 5:1-2, 5-8. Saint Paul’s letters are often very difficult for us to read aloud and difficult to understand when they are read. They demand extra preparation on the part of the reader. This one is no exception. Take it very slowly; if people are to get anything from it, you must not go too fast. Be very careful about the order of words: the first sentence is awkward: it can be split up like this: “Through our Lord Jesus Christ / by faith we are judged righteous / and at peace with God, / since it is by faith / and through Jesus / that we have entered this state of grace // in which we can boast about looking forward to God’s glory.” Stress the words ‘poured into our hearts’ - this in a subtle way echoes the theme of water once more! Allow your own heart to speak in the passage beginning ‘We were still helpless...’ - you are talking about the supreme human sacrifice, so feel the love that it proves: contrast ‘it is not easy...’ with ‘what proves God loves us...’ If read well, this is a tremendously moving reading. If read without preparation and understanding, it is incomprehensible! "God is Love" and love is his first gift, containing all others. "God's love has been poured into our hearts through the Holy Spirit who has been given to us." Because we are dead or at least wounded through sin, the first effect of the gift of love is the forgiveness of our sins. The communion of the Holy Spirit in the Church restores to the baptized the divine likeness lost through sin. He, then, gives us the "pledge" or "first fruits" of our inheritance: the very life of the Holy Trinity, which is to love as "God [has] loved us." This love (the "charity" of 1 Cor 13) is the source of the new life in Christ, made possible because we have received "power" from the Holy Spirit. By this power of the Spirit, God's children can bear much fruit. He who has grafted us onto the true vine will make us bear "the fruit of the Spirit: . . . love, joy, peace, patience, kindness, goodness, faithfulness, gentleness, self-control." "We live by the Spirit"; the more we renounce ourselves, the more we "walk by the Spirit."